Edith Kanaka'ole Multipurpose Stadium and televised on KITV. Tickets needed. * Merrie Monarch Festival Free Workshops An Artistic Collaboration: Hula and Kapa: An artistic collaboration between a hui of contemporary kapa makers and Halau O Kekuhi has resulted in a showcase of Hawaiian kapa in its functional, cultural and traditional use and form. * Merrie Monarch Festival Free Workshops Papa Hula Workshop - Kumu Hula Nani Lim Yap will lead a workshop on the basic movements of a simple hula. Edith Kanaka'ole Multipurpose Stadium and televised by KITV. Tickets needed. * Merrie Monarch Festival Free Workshops Ka Lei Puakenikeni - Hilo raised Mark Yamanaka soulfully bridges country ballads and Hawaiian falsetto. He will perform songs from his debut solo album. * Merrie Monarch Festival Free Workshops Performance by UNUKUPUKUPU - Dr. Taupōri Tangarō and Kumu Mānaiakalani Kalua, associated with Hawai‘i Community College, will perform didactic hula. * Merrie Monarch Festival Free Workshops: What is ‘Ūniki? - Hōkūlani Holt has been the Kumu Hula for Pā‘ū O Hi‘iaka on Maui for 35 years now. * Merrie Monarch Festival Free Workshops: From Pā‘ū o Hi‘iaka - Hōkūlani Holt, Lono Padilla, Robert Ka‘upu & ‘Ulalia Woodside - A panel of Kumu Hula will discuss their experiences in ‘ūniki, the traditional form of passage by which a dancer becomes a master of Hula. This evening event is special gift to the residents of Hilo and visitors. 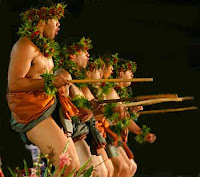 It is performed in the same statium as the Merrie Monarch Hula competitions, with the same pagentry, and it is free. So those that are unable to get a ticket to the evening competitions can still get the thrilling experience by attending the Ho'ike. The only catch is that the popularity of the event and the open seating means you need to get in line very early to get a good seat. Our first year to the Ho'ike we got in line at 5PM and were very surprised to find that the line already extended from the Stadium all the way to the Civic Auditorium. We missed the entrance of the Royal Court and the Pule (since they close the gates during that time) and finally got a seat behind the stage which limited our view of the dances. The next year we got in line at 2:30PM with water, food, lawn chairs, crossword puzzles and an umbrella (because it was raining). Being in line for that many hours you become friends with the many visitors and locals with shared enthusiasm for the event and hula. Look at some pictures and movies from previous Ho'ike in 2009 and 2008 to get an idea of what the event is like. * Merrie Monarch Festival Free Workshop: Mōhalu Nāpua Makua - Nā Hōkū Hanohano Award winner for “Best Female Vocalist” (2008), Nāpua Makua will perform mele from her newest album, Mōhalu. * Merrie Monarch Festival Free Workshops: ‘A‘a i ka Hula: A Contemporary Drama of the Historical Perspectives of Hula - - Hula is a Hawaiian language contemporary hula drama that will be presented by the 9th-11th graders of Ke Kula ‘O Nāwahīokalani‘ōpu‘u. A historical journey through the ancient and modern nuances of the art of hula. This festival is an all day celebration of hula and Polynesian dance performed by Kupuna and Keiki and others in Hula Halaus and dance groups. The music accompaniment is often performed by the same groups that later accompany their Halau's competitve Hula group in the 'Auana competition. And sometimes the Kumus' dance for the crowd. The event is free and seating is open. Merrie Monarch T-shirts and programs are on sale as well as food and drinks. Look at some pictures and movies from previous Ho'olaulea' in 2010 and 2009 and 2008 to get an idea of what the event is like. The Merrie Monarch Hula Competition is only a mere few days away. The community in East Hawaii is getting ready for the big annual celebration and one can feel the anticipation of this magic event coming. The smell of flowers, craft fairs setting up around Hilo Town and people getting out their finest Aloha wear. It is no coincident that Merrie Monarch always takes place the week after Easter. It is the spirit of spring, renewal and resurrection of the perpetuation of old traditions and people coming together in peace and celebration. 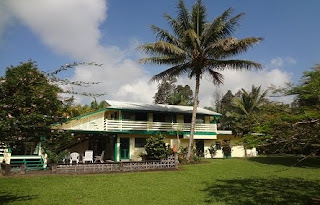 Here, at Hale Moana Bed & Breakfast we so much enjoy this festive mood and atmosphere and are looking forward to sharing it with all our visitors. You can find a detailed calendar of events for the entire Merrie Monarch week when you follow the link. 30 minutes from Hale Moana Bed & Breakfast in Hilo the famous annual Merrie Monarch Hula Competition will take place from April 24 - 30. It is a magical time, when all of Hilo town is in a festive ambiance celebrating the art of Hula and the Hawaiian Culture. It is a community event with everybody involved from the Keiki (children) to the Kupuna (Elders): Hula performances in parks, public places and all around town, fabulous arts and crafts shows, the smell of fresh flowers everywhere, beautiful leis, everybody out in their finest Aloha wear, cheerful and happy. It is one of the most wonderful times here on the East side of the Island and as a visitor this magic is contagious and carries over to all open to be taken in by it. What makes this event so special is the fact, that it is not put on as a festival for visitors. It is genuine and authentic. It is the perfect time to experience Hawaii, its cultural richness and overabundant beauty. It's also a time to closely experience some of Hawaii's most famous performers, entertainers and musicians: Keali'i Reichel, Robert Kazimero, members of the Beamer family, Sonny Ching, Ray Fonseca, and many other kumu hula and their halau from around the world. The event starts on Wednesday night (April 27) with the Ho'ike Performance, a free exhibition night of hula, international performers and music. Thursday night (April 28) features the Miss Aloha Hula competition of individual women for the title of Miss Aloha Hula. Contestants perform hula kahiko (ancient hula), hula 'auana (modern hula) and oli (chanting). On Friday night (April 29) groups of women and men perform Hula Kahiko. 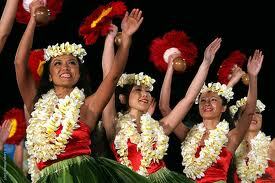 Saturday (April 30) night, the final evening, presents women and men groups dancing the modern style hula ('auana). At the end of this evening the overall winners of both group hula nights are celebrated. 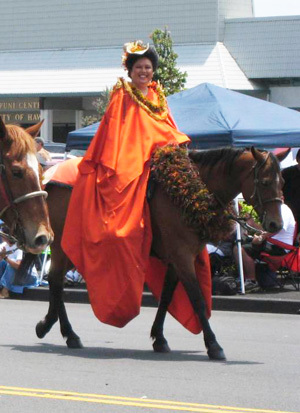 The week-long event finds its finale in the Sunday parade (April 30th) through downtown Hilo as one of the festival's most entertaining and fun parts for the whole family. Tickets are mostly pre-sold, but may still be available at the door of the Edith Kanakaole Tennis Stadium on the evenings of the competition events. More information is also available on the official Merrie Monarch website www.merriemonarch.com.